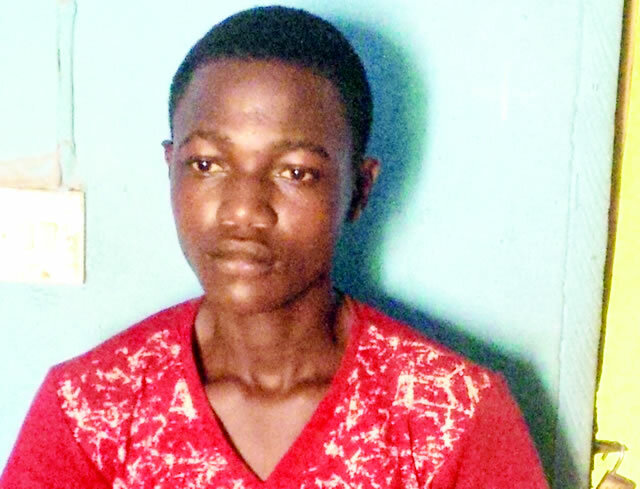 A 21-year-old suspected robber, Akeem Popoola, says a police inspector attached to the Special Anti-Robbery Squad of the Lagos State Police Command, Ikeja, uses him to swindle unsuspecting victims. He said he had worked for the policeman, identified as Inspector Festus, aka Ijaya, for about four months before he was arrested.The carpenter, who is currently in custody at the Agbado divison, Ogun State, was arrested for robbery and burglary. A mattress and speakers of a sound system were reportedly recovered from him in the Giwa area of Agbado on April 6. He told PUNCH Metro that apart from burglary, he used to collect phones from the inspector and he would later sell them. He added that Ijaya and two others – Abbey and Aluko – would get the buyers arrested minutes later for buying stolen items.Akeem said their victims paid Ijaya between N120,000 and N150,000 before they were released, adding that he got N5,000 as his share on each ‘deal’. “In November 2015, one of my father’s tenants and I fought. When my daddy came back home on that day, she reported me to him and he handed me over to Inspector Festus at the state police command headquarters, Ikeja. He told him I was too troublesome and wanted him to discipline me. But he (Ijaya) did not. He took me to a beer parlor at Alakuko and gave me N5,000. I was very surprised. “Two days after, we met at another beer parlour around Agbado, where I was made to swear an oath. He brought out a gun and put some gin inside the barrel. He drank from it and gave me the gun to do same. He said he would be sending me on some errands. He gave me a mobile phone and drove me in his Toyota Camry to POWA complex in Ikeja. “He told me to sell the phone inside the complex which I did for N20,000. After an hour, he handcuffed me and took me in his car with his boys – Abbey and Aluko – to the man that bought the phone. He arrested the man and told him to pay N200,000 if he did not want to be taken to the station. The man raised N150,000 among his friends in that complex and gave him. He said the second deal he had with Ijaya was an iPad he sold to another unsuspecting victim around Ikeja. He said he got a N5,000 share from the N150,000 bribe the inspector allegedly collected from the buyer, who was also accused of acquiring stolen property. He added that when he decided to quit, Ijaya refused. Akeem said that Ijaya threatened they had sworn an oath and that he would die if he backed out from the deal or revealed it to his father. “Sometime in February, the inspector gave me a Techo phone which I sold to a guy at Agbado. The guy gave me N7,000 and a small phone. Thirty minutes later, we went back with my hands handcuffed. And as he normally did, he collected about N120,000 from him before he was released. I also got my N5,000 share. I can say all this in his presence,” he added. Akeem said he had stolen a plasma television at Oke Aro area of Agbado on the order of Ijaya, insisting that the item was still with the policeman. His father, Mr. Ahmed Popoola, who regretted handing him over to the policeman, said his son was a thief before he took him to Ijaya for discipline. He said he strove to meet Akeem’s needs and had counselled him on several occasions to no avail. “He had been stealing before I took him to a police friend, Yekini, who handed him over to Ijaya with a belief that he (Akeem) will change if he sees the way thieves are being punished. He had been embarrassing me. He still has a case in the Sango-Ota division. I was arrested and detained because of him. The spokesperson for the Ogun State Police Command, DSP Muyiwa Adejobi, said the police were on the trail of Ijaya and his accomplices. He added that the case had been transferred to the command’s Special Anti-Robbery Squad. But the Lagos State Police spokesperson, SP Dolapo Badmos, denied that Ijaya was a serving cop in the command.